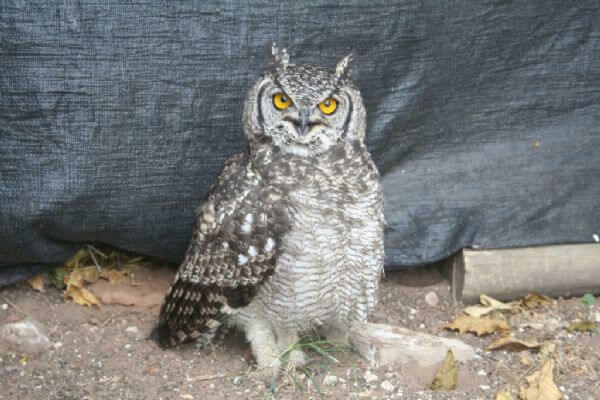 A Spotted Eagle owl was found on a golf course sitting on the ground. After a check it looked like he had some brain damage. He was brought in and is doing much better. He is eating well and is on the road to recovery. A young black headed heron was found in a neighbouring town where it fell out of its nest. As the pine tree had lots of nests, it was impossible to find out which nest it came from to try and put it back. It is the newest addition to the rehab patients and is also doing well. He will stay at the centre until he is fully fledged and can fly. A beautiful young Southern Pale Chanting Goshawk was found on a farm with a broken leg. The leg is now strapped and he is becoming more and more active as time goes by. This is good for building up the muscles and the healing process. When his leg has healed completely he will be released in the surrounding area. The three cute caracal kittens are still doing very well. They were found on a farm when they were only a few days old. Their eyes were still closed and they couldn’t fend for themselves. They have grown a fair bit and they love to climb and explore their holding pen. Armed with very sharp little claws and teeth they’re not as easy to handle. They’re enjoying the meaty addition to their diet instead of just milk and will stay at the rehab centre for a while longer until they are fully adult. When they are fully grown caracals they will go back into the wild where they belong. Pay a visit to the Wildlife Rehabilitation Centre next time you’re at Shamwari. Make a booking enquiry today.